A Breast MRI is a noninvasive screening procedure of cancer patients. An MRI of the breast provides the most detailed image that cannot be obtained by other methods, such as mammography or ultrasound. A breast MRI is an excellent tool in treatment planning for newly diagnosed breast cancer patients, since it evaluates scar tissue to exclude recurrent disease and evaluates of the option and quality of implants. Women with a BRCA1 or BRCA2 mutation. Women who have undergone chest radiation between ages 10 and 30. Women who have Li-Fraumeni, Cowden, or Bannayan-Riley-Ruvalcaba Syndrome. Breast MRI’s are NOT to be considered a replacement for regular mammograms. Rather, it is a supplement tool for assessing breast abnormalities and monitoring treatment. The primary use of breast ultrasound is to help diagnose breast abnormalities detected during mammograms. Breast ultrasounds are critical for evaluating potential abnormalities seen on a mammogram. 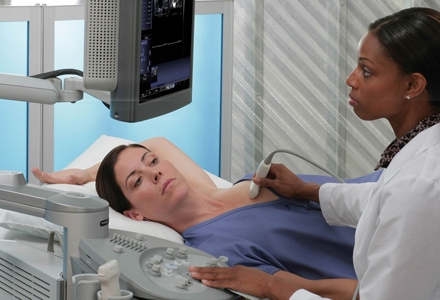 Ultrasound imaging can help to determine if an abnormality is solid.